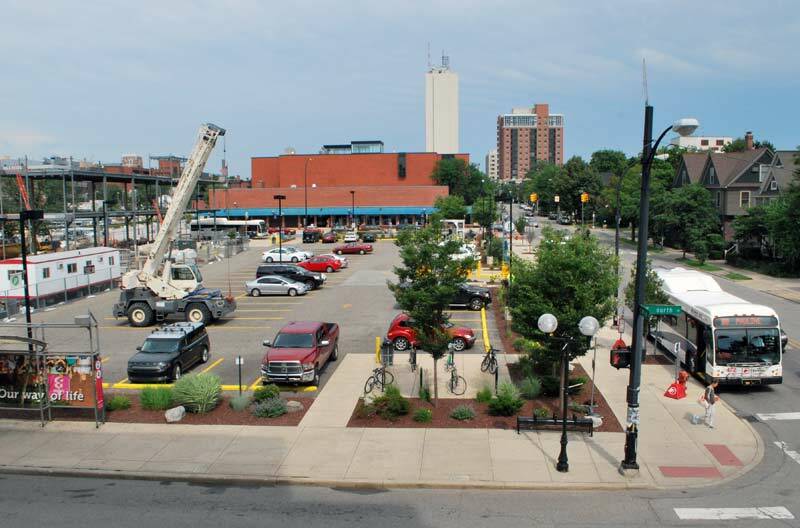 Two major downtown projects – the possible sale of the former YMCA lot, and a review of the A2D2 zoning – were the main focus at a July 9 working session of the Ann Arbor planning commission. Looking east at the former YMCA lot, which has been owned by the city since 2003 and is used as a surface parking lot. The street in the foreground is Fourth Avenue. William Street is on the right. The reddish brown building at the opposite end of the lot – across Fifth Avenue – is the Ann Arbor District Library. To the left is the construction site for the new Blake Transit Center. Planning manager Wendy Rampson updated commissioners on the city council-mandated review of downtown zoning. Ann Arbor-based ENP & Associates – consultants Erin Perdu and Megan Masson-Minock – are being hired to handle the process under a $24,500 contract with the city. The primary concern for the council, as reflected in its April 1, 2013 resolution, is the downtown D1 zoning – which provides for the highest density allowed in city, with the tallest possible buildings. The concern was heightened by the controversial 413 E. Huron development, which the council approved on May 13, 2013. That site, located on a major transit corridor, but also next to a residential neighborhood, is zoned D1. Rampson described the upcoming work as “fast and furious,” with a deadline of Oct. 1 to deliver recommendations to the council. The consultant will work initially with the commission’s ordinance revisions committee, which next meets on Tuesday, July 16 at 5:30 p.m. in the first floor south conference room at city hall, 301 E. Huron. Zoning was also a point of discussion regarding the former Y site at 350 S. Fifth, across from the downtown Ann Arbor District Library and south of Blake Transit Center. The city council is exploring whether to sell that city-owned property, which was zoned D1 as part of the original A2D2 process. Colliers International and local broker Jim Chaconas have been selected to handle the possible sale, as the city faces a $3.5 million balloon payment this year from the purchase loan it holds on that property. Bonnie Bona floated the idea of developing recommendations to the council regarding what planning commissioners think the city should require in a sale of that site. “I think we have a responsibility as planning commissioners to give them planning advice,” Bona said. Other commissioners agreed, and the item will likely be on the agenda for the group’s Aug. 13 working session for a fuller discussion. The 2.5-hour July 9 session also included a presentation by two Ann Arbor public art commissioners – John Kotarski and Bob Miller – about the finalists for artwork at the East Stadium bridges. And commissioners were updated by Rampson about the status of various projects and developments. This report focuses only on the Y lot and A2D2 discussions. The city’s involvement in the former YMCA site dates back to 2003, when the city bought the property at Fifth & William in order to preserve the 100 units of single-residency occupancy (SRO) affordable housing that the building offered. The city council at the time made the move because the YMCA, which relocated to a new building at 400 W. Washington, had no plans to incorporate residential units at its new site. The Ann Arbor Transportation Authority, which had contemplated redeveloping the old Y property as a transit center and office headquarters, also wasn’t interested in providing housing. The city used a loan to purchase the property from the YMCA for $3.5 million. Then in 2008, the council voted to extend its five-year loan with the Bank of Ann Arbor for another five years, through the end of 2013. The interest rate is 3.89%. The interest-only payments work out to roughly $140,000 a year. By the end of 2013 – when the $3.5 million balloon payment is due – the total interest paid will be around $1.4 million. In December 2004, the city council voted to authorize issuing a request for proposals (RFP) for development of the site, and the following year selected the developer HDC to pursue a project there. The original purchase option agreement with HDC for the land was approved by the council on Sept. 6, 2005. Affordable housing units were part of HDC’s subsequent William Street Station proposal. That same year, mechanical systems in the old YMCA building failed to such an extent that residents needed to be moved out of the building. City staff led by Jayne Miller, who was community services area administrator at the time, worked over the following few years to find alternate accommodations for the residents. The city maintained a stated commitment to eventually replacing the 100 units, but not necessarily at the site of the old YMCA. After encountering various difficulties and attempting to modify its project, HDC and the city signed a new purchase option agreement on Oct. 12, 2007 that included specific milestones. One of those milestones included obtaining a demolition permit from the city by Oct. 15, 2007. However, when HDC filed its application with the city for the permit, HDC contends it was informed by city staff that only the owner of a property could be granted a demolition permit – so HDC could not obtain the permit because it was not yet the owner. The city still owned the property. HDC complained that the condition was one that was impossible to meet. Soon after, a resolution was considered by the city council on Nov. 5, 2007 to extend the purchase option agreement, but it failed on a 5-6 vote. On the side of extending were councilmembers Joan Lowenstein, Leigh Greden, Margie Teall, and Wendy Woods. Against extending the agreement were John Hieftje, Bob Johnson, Ron Suarez, Stephen Rapundalo, Stephen Kunselman, and Christopher Easthope. The failure to extend was the basis of one of the counts alleged in a lawsuit that HDC filed in 2009 – that the city failed to act in good faith and deal fairly with the firm. Ultimately the court ruled against HDC. In broad strokes, the ruling indicated that HDC, as a sophisticated developer, should have known better than to sign an agreement with an impossible condition, and that the city had not breached its contract. The vacant building on the site was condemned and ultimately demolished. The cost of demolishing it and abating asbestos was around $1.5 million. The Ann Arbor Downtown Development Authority covered the demolition costs and has covered half of the interest payments on the purchase loan. So the total amount of Ann Arbor governmental investment in the property is at least $6.4 million – not including attorney fees. 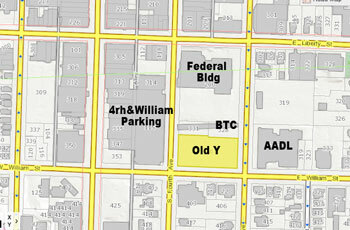 Since the building was demolished, the site has been used for surface parking and is managed as part of the downtown parking system by the DDA, under contract with the city. Revenue from the surface parking lot on the site – which charges a $1.40 hourly rate – amounts to $105-$140 per space per month for roughly 140 spaces. Through the end of 2012, the lot generated a rough average of around $20,000 per month. But usage has decreased since the opening of the new 711-space Library Lane underground garage, located across the street. 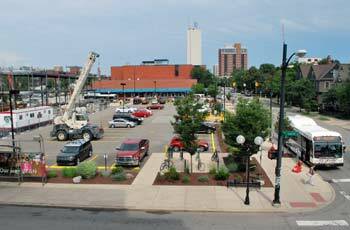 And the number of spaces available for parking on the lot has decreased from 140 to 76 spaces – as some of the area has been used for construction staging for the new Blake Transit Center under construction by the Ann Arbor Area Transportation Authority. That parking revenue from the former Y site is collected by the Ann Arbor DDA. A contract under which the DDA manages the city’s public parking system gives the city 17% of the gross parking system revenues. Also under terms of the contract, the DDA has the option to object to eliminating a facility from the parking system – such as the Y lot – but it must file its objection within 30 days of being notified by the city. For some, like city councilmember Stephen Kunselman, the evaluation of the financial equation for the parcel needs to include the whole parking system. And that includes the fact that the DDA uses some TIF revenues – taxes captured from the taxing authorities in its district – to make payments on bonds that were issued for improvements and new construction of other parking facilities. The Y site – located directly across the street from the downtown Ann Arbor District Library – is also one of five parcels that was the focus of the DDA’s Connecting William Street project. That project was undertaken by the DDA based on a directive from the city council given at its April 4, 2011 meeting. The intent was to make recommendations for possible future development, in a cohesive way, on those five sites: (1) the Kline lot (on the east side of Ashley, north of William), (2) the lot next to Palio restaurant (northeast corner of Main & William), (3) the ground floor of the Fourth & William parking structure, (4) the former YMCA lot (on William between Fourth and Fifth), and (5) the top of the Library Lane underground parking garage on South Fifth, north of the downtown library. In January 2013, the DDA gave a presentation to the council on its Connecting William Street recommendations. The council never took action on that proposal. However, at its March 5, 2013 meeting, the Ann Arbor planning commission voted to adopt the report as a resource document supporting the city’s master plan. Kirk Westphal, the commission’s chair, also served on an advisory board for the Connecting William Street effort. Former Y Lot: Recommendations to Council? 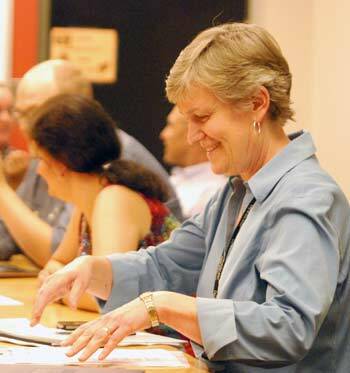 At the planning commission’s July 9, 2013 working session, Bonnie Bona reported that she’d met with a few members of the Ann Arbor energy commission and city councilmember Sabra Briere, who also serves on the planning commission. They had discussed the city’s sustainability framework and climate action plan, and how they could keep those efforts moving. Some of their discussion touched on the former Y lot and its possible sale. 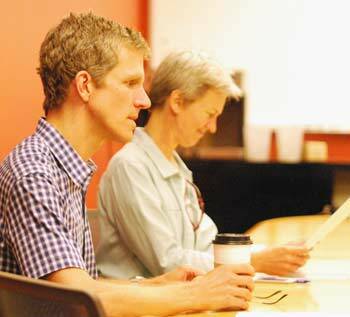 Planning commissioners Kirk Westphal and Bonnie Bona at the July 9 working session. 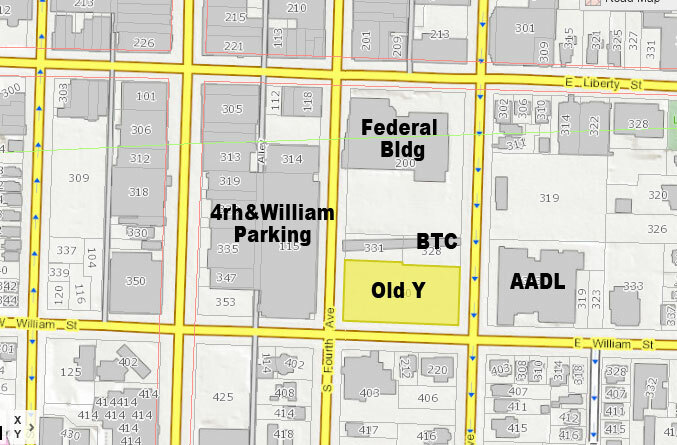 At its March 4, 2013 meeting, the city council voted to direct the city administrator to prepare an RFP (request for proposals) for brokerage services to sell the former Y lot. Soon after, the energy commission started talking about what should be incorporated into the sale, as it relates to the climate action plan. Historically, Bona said, the city has used a planned unit development (PUD) for developing city-owned property, so that there’s an element of public benefit built into the project. Energy commissioners wanted to send recommendations to the city council regarding what they felt the city should require in a sale of that property, related to energy efficiency, renewable energy or other issues. She also observed that in the past, the city has typically required a higher level of accommodation for land it owns, as a community asset – beyond just zoning and selling it. The last city property that was sold downtown was the former parking structure at First & Washington, where City Apartments is under construction. It was a PUD, with public parking on the lower levels as a public benefit. Bona noted that she was on the selection committee for that project, to review responses to the city’s request for proposals. A PUD was required, but there were no other specific requirements in the RFP, she said. Bona thought that planning commissioners could “get into the weeds” if they tried to make really specific recommendations, like pursuing LEED Gold certification or requiring a certain amount of green space. Her suggestion was to raise more general issues related to the kinds of things that the city should be looking at – like land uses, sustainability, height and other considerations. She wanted to get feedback from other commissioners about whether this was something they wanted to pursue. “I think we have a responsibility as planning commissioners to give them planning advice,” Bona said. Paras Parekh wondered how such recommendations would be conveyed to potential developers. The RFP would list a set of goals, Ken Clein explained, and potential proposals would be evaluated in that context. Bona suggested getting a copy of the original RFP for the First & Washington site, to give commissioners an idea of what’s been done in the past. At this point, Bona noted, the city council hasn’t laid out a process for how a buyer would be selected, beyond selecting a broker. In general, the city struggles with the development process for the sites it owns, she added. She’s heard from some former planning commissioners who believe the commission should make recommendations about how the process should be handled. But Bona said she’s not convinced that’s the commission’s role. Development on top of the Library Lane underground parking structure is another example of an RFP process that did not move forward, Rampson said. [For a sampling of Chronicle coverage on that RFP process, see: "Hotel/Conference Center Ideas Go Forward" (January 2010); "Column: Library Lot – Bottom to Top" (March 2011); and "Council on Valiant Library Lot Idea: Hail No" (April 2011). Kirk Westphal, the commission's chair, gave some background on the DDA's Connecting William Street project. Two years ago, the council was reflecting on its difficulty in producing "productive proposals" for 415 W. Washington and the Library Lane sites, he said. So the council directed the DDA board to look at the potential of five city-owned sites in the downtown area, and how those sites might be developed. Westphal noted that he served on the subcommittee that was responsible for community engagement, and said "it was the most community contact that had ever taken place in any planning project in Ann Arbor history." The project got "a little distracted" because it didn't tackle the issue of open space, he added – that's now being handled by the city's park advisory commission. "In the process of confusion about that, a lot of the recommendations have not been looked at very closely," he said. 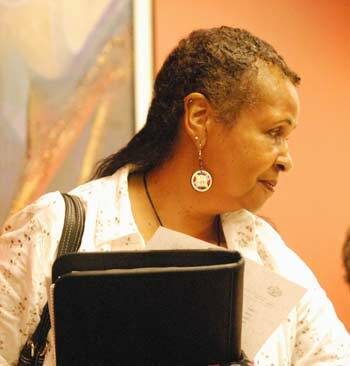 Bona added that she felt the Connecting William Street recommendations reflected valuable public input. 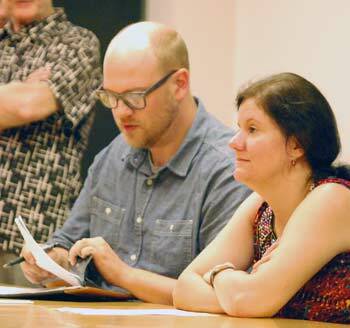 Planning commissioners Jeremy Peters and Diane Giannola. Diane Giannola clarified with Rampson that if the city sells the land without an RFP, it would be sold for the price alone, without restrictions. Rampson noted that the property is currently zoned D1 [the highest allowable density]. She explained that when the A2D2 zoning process took place, all parking structures and publicly owned land – with the exception of county property – were zoned to be consistent with the city’s master plan. It’s possible to rezone the property, she added, but at this point the Y lot is D1. Clein ventured that real estate brokers will advise the city to keep it zoned D1, because that will bring the best price – and in turn the highest fees for the brokers. Commissioners talked about how the council will need to decide whether to seek the highest price or try to shape the kind of development it wants on that site, and whether to go for short-term or long-term value. “And then there’s politics,” Clein quipped. Woods pointed to another factor – that a portion of the proceeds from this sale will be put into the city’s affordable housing trust fund, based on direction from the council. Rampson described the Y lot as “a multi-layered site.” It includes a previous commitment to replace 100 units of affordable housing that had been at the site when it was owned by the YMCA. The council had determined that one way to address that commitment was to put net proceeds from the sale into the affordable housing trust fund, she explained. Jeremy Peters agreed, saying he felt it was the commission’s duty to provide advice in some way. That might be suggesting a process, or elements of an RFP, or how the site should fit into the overall downtown and entire city. Clein also supported making recommendations, but cautioned against telling the council what to do. “In my experience, that tends not necessarily to bring the desired results.” He thought that making general suggestions – like providing open space – was a better approach, rather than recommending a specific amount of open space in a specific location. Woods observed that some people feel certain parameters in previous RFPs issued by the city have caused projects to fail, because those parameters couldn’t be met. Rampson indicated that she’d heard this complaint regarding 415 W. Washington, although she noted that the economic downturn was another factor at that time. But there weren’t any real parameters for the Library Lot RFP, Rampson said. That resulted in a wide array of responses, from senior housing to conference centers, she said. Clein framed the question this way: Should the city have a say in what gets built on the Y lot, or is the community benefit simply the cash that the city gets from selling the property? “It is much more challenging and much more involved to try to seek development proposals, evaluate those proposals and select one. The city is on the hook much more so financially in doing that, rather than just selling it off,” he said. But Clein felt it was worthwhile to discuss what kind of stake the city might have or influence it should exert on that site. Peters noted that even if the city council decides just to sell the property, at least there will have been a discussion about potential uses that a developer could take into consideration. Clein suggested that one possibility is to simply make it mandatory for a developer of a city-owned property to follow the suggestions of the design review board. At this point, going through the design review process is mandatory, but compliance with the board’s suggestions is voluntary. Generally, he noted, the board’s comments have been very pragmatic. Bona suggested focusing on a few important elements, which if implemented could set the stage for better development on other sites. Following the design guidelines might be one example, she said. Giannola proposed making recommendations that outline what the city doesn’t want. “Sometimes you don’t know what you want until you see it,” she said, but you know what you don’t want. Westphal noted that often developers face financial pressures and timelines to get a return on their investment. One possibility is for the city to accept a little less money up front, he said, in exchange for insisting on higher quality materials and architecture. That approach recognizes that over the long-term, a higher quality building will bring higher taxable value to the city. Woods, who works at the University of Michigan, observed that “as much as people harp about the university, it does put up some pretty buildings.” Clein indicated that UM is willing to spend a lot of money – roughly three times the cost per square foot of a typical development. The commissioners who were present reached a consensus to move forward on making recommendations. Bona and Giannola agreed to prepare a draft of possible issues to include, which the commission will then discuss at a future working session. Recommendations would be brought to a regular planning commission meeting for a formal vote. Clein wanted to make sure that someone had “taken the temperature” of the commission’s city councilmember, Sabra Briere, who did not attend the July 9 working session. Bona indicated that Briere had encouraged this approach. Westphal suggested that Amber Miller of the DDA could be invited to a future working session to review the Connecting William Street recommendations for this parcel. Rampson indicated that the topic could be placed on the agenda for the commission’s Aug. 13 working session. She offered to provide copies of the RFPs for the William Street Station and First & Washington sites before then. Bona also recommended that commissioners review the city’s master plan as it relates to the site, as well as the Connecting William Street report. Also at the July 9 working session, commissioners were updated on the review process for the city’s A2D2 (Ann Arbor Discovering Downtown) zoning. The commission had been scheduled to conduct an earlier review of the overall A2D2 zoning, which had been adopted in 2009. However, until recently – because of the economic downturn – few projects have been built. The primary focus on the downtown D1-D2 zoning – the highest density allowed in the city, with the tallest possible building height – was made in light of the controversial 413 E. Huron development, which the council approved on May 13, 2013. That site, located on a major corridor but next to a residential neighborhood, is zoned D1. At the July 9 working session, planning manager Wendy Rampson reported that the commission’s executive committee and councilmember Sabra Briere, who serves as the city council’s representative on the planning commission, had interviewed two potential consultants to handle the review. The executive committee includes chair Kirk Westphal, vice chair Wendy Woods, and secretary Ken Clein. Bonnie Bona also participated in the interviews. Rampson said the committee decided to hire a consultant in order to have fresh eyes on the zoning, given that staff and several planning commissioners had been so immersed in developing the A2D2 zoning. Another factor was the speed at which this council-directed review must take place, she said. The consultant’s work will include interviews, focus groups and stakeholder meetings to solicit concerns about the A2D2 zoning. At the end of that process, in consultation with the commission’s ordinance revisions committee (ORC), there will be a list of prioritized items to work on, Rampson said. Those priorities will include items that the city council has identified, she said, “but there’s a whole host of other issues that people have raised” like affordable housing and LEED certification. The next stage would be to develop recommendations regarding how to address those priorities. Rampson called it a very ambitious schedule. The ORC members – Bonnie Bona, Kirk Westphal, Wendy Woods and Diane Giannola – will meet next week to kick off that process. Bona noted that it might require going back to the council to ask for more time, but that ENP is confident that the project can be completed by the Oct. 1 deadline. Rampson reported that ENP & Associates is handling the Shape Ypsilanti project, which is an update of the city of Ypsilanti’s master plan. The consultants put a lot of focus on social media, she said, but also use a lot of face-to-face interactions to get feedback. They also use tools like SketchUp to help people envision things like height and massing. Rampson clarified that the review will address the council’s directive, but will also be broader to encompass other aspects of A2D2. She noted that there’s a concurrent effort to review the downtown design guidelines, which is being led by councilmember Marcia Higgins. But issues like transportation or historic preservation aren’t part of this review, she said. The review will encompass zoning and design, as it interacts with zoning. Developing priorities will be the first phase, Rampson noted. From that list, certain items will be worked on further to deliver recommendations to council. However, given the capacity of staff and the planning commission, other priorities will be worked on over a longer period of time, she said. Paras Parekh asked if there had been public input on the original A2D2 process. Yes, Rampson said – a lot. Bona noted that the original input was based on how things were expected to develop. However, now there have been several completed projects, so people have a better idea of what the zoning actually allows. Eight projects have been built downtown, including a couple of smaller ones, Rampson added. Commissioners also discussed the process that had gone into developing the A2D2 zoning, including decisions that Bona described as somewhat arbitrary. “In the end, some of it was that council just made a decision,” she said. Now, the city can go back and “adjust the things that turned out wrong,” Bona said. It’s really the developer who shapes a project, Rampson said. The zoning just provides an envelope in which to operate. Bona referred to the process involving Calthorpe Associates, California-based consultants who were hired by the city to help develop a downtown plan prior to A2D2. That process solicited solid public input, she said, with community-wide design charettes and other opportunities for feedback. Rampson described that process as developing a big-picture vision for downtown, which was followed by the A2D2 zoning that was meant to implement that vision. The A2D2 process had an advisory committee that met for about eight months, she said, then it was taken on by the planning commission. There was also a steering committee that included representatives from the DDA board, the city council and the chair of the planning commission. Rampson noted that she personally attended 33 meetings throughout that process. “I don’t have Susan Pollay’s record, but … it was a pretty large undertaking.” Pollay is executive director of the Ann Arbor DDA. Rampson indicated that despite significant changes in zoning, there have been relatively few problems with the zoning revisions. Bona noted that some projects – like Zaragon West – resulted in very little public interest, which indicated that the projects were acceptable and that the zoning worked. One indication that the zoning works, Rampson said, is that at least one former PUD – Kingsley Lane, at Kingsley and Ashley – is likely to return with a project designed for the site’s current zoning, which is D2. Responding to queries from commissioners, Rampson said the Kingsley Lane developers, including local developer Peter Allen, almost lost the property to the bank. But they’ve secured the property now and are expected to submit a site plan for that project soon. Rampson wrapped up the discussion by describing the upcoming work as “fast and furious,” beginning with the ordinance revisions committee. The ORC meets on Tuesday, July 16 at 5:30 p.m. in the first floor south conference room at city hall, 301 E. Huron. For additional background on the original A2D2 zoning process, see Chronicle coverage: “Downtown Planning Process Forges Ahead” (November 2009); “Another Draft of Downtown Design Guides” (October 2009); and “Downtown Design Guides: Must vs. Should” (September 2009). Present: Bonnie Bona, Ken Clein, Diane Giannola, Paras Parekh, Jeremy Peters, Kirk Westphal, Wendy Woods. Also: Planning manager Wendy Rampson. Absent: Sabra Briere, Eleanore Adenekan. In two spots in this article the Chronicle said that 413 E. Huron was approved on March 13. However, as the Chronicle’s links show, it was approved on May 19. Thanks for this fabulous review of the checkered past of the former Y lot. You covered it all! The only thing that is missing is the impact that the failure to develop low-income,supportive housing on the site has had on our community. When we all built the Delonis Center, part of the reason for siting it on Huron and 1st was because of its proximity to the Y as people could then move quickly from the shelter to permanent housing with supportive services. Now that we have lost those housing units, it is much more difficult to find housing for people who have become chronically homeless in our community. In the Washtenaw Housing Alliance’s annual Point in Time Count, conducted in January 2013 in conjunction with Washtenaw County, we learned that the number of people considered to be chronically homeless has nearly doubled over the count conducted in 2011. We must assume that at least a part of the reason for this increase is that we have so little suitable housing available. While it is clear that decisions have been made not to replace the housing on the former Y site, the Ann Arbor community still has a huge need for affordable housing with supportive services for the people who are most vulnerable in our community. Hopefully, the Planning Commission members will take note of this need as they make their recommendations to the City Council. Re:  We did botch the date. But we were exactly two months off: The approval came on May 13, not March 13. [The May 19 date is when the article was published – about the May 13 meeting. That also shows that we are slow.] I’ve corrected the date without the customary strike-through, as I’m not able right now to get the styles to interact properly with the link styling. Thanks for the heads up. This includes a good summary of the “old Y lot” history, considering the length limitations of a Chronicle article. There are additional eddies and swirls. One note is that Alan Haber originally proposed to use the old Y as a Commons (he responded to the RFP). He later made that proposal for other sites. You mention that HDC “attempt(ed) to modify its project”. I have documented that in my post [link] in which I note that HDC shifted from the original plan for mostly housing and office to one that included a hotel and conference center. The site plan was actually approved by the Planning Commission just before the rug was pulled out by Council. In my post, I link (by inference) that event to emerging plans by others for a hotel and conference center. I interviewed Bob Jacobson for the post (did not quote him as he had a lawsuit against the city at the time) and he had actually talked with one of the originators of the Valiant proposal about his idea.